Many families are unsure as to when to upgrade to a booster seat. The type of booster seat, required in all states, depends on the size and weight of the child and the type of vehicle. Here's some important guidelines on car seat safety to avoid misuse and decrease the risk of serious spinal cord and head injuries. According to the US Centers for Disease Control (CDC), the leading cause of death for children below the age of 15 are unintentional accidents, and most of those are caused by vehicle crashes.All 50 states, US territories and the District of Columbia have child restraint laws. As a rule, children under one year of age must be in an infant seat, ages 1-3 in a convertible car seat and 4-8 in a booster seat. All states and the District of Columbia, except Arizona, Florida and South Dakota, require booster seats for children who have outgown their child safety seats. Parents should verify specific rules in their state to ensure that they are not breaking the law. State-by-state information can be found at the Governor's Highway Safety Association. Many laws require all children to ride in the rear seat and permit children over a particular age, height or weight to use an adult safety belt. In Kentucky, children under six but weigh over 50 lbs. may use the adult safety belt but in Oregon, children must be at least 4'9" and between age 8 and 15 before using adult safety belts. Just like any other motor vehicle violation, disobeying car seat laws will cost drivers for not complying with a state's child passenger safety regulations. Most child restraint laws are primary violations, meaning law enforcement may stop vehicles solely for failing to restrain children properly. Maximum first offense fines for noncompliance of passenger safety laws vary from $10 in New Jersey to a $500 fine in Nevada. Most laws require all children to ride in the rear seat whenever possible, infants use rear-facing infant seats; toddlers use forward-facing child safety seats, and older children use booster seats. However, up to 80% of child safety seats are used improperly.2 Correct installation of child safety seats help keep children safe and depends on your child's age, size and type of vehicle you have. 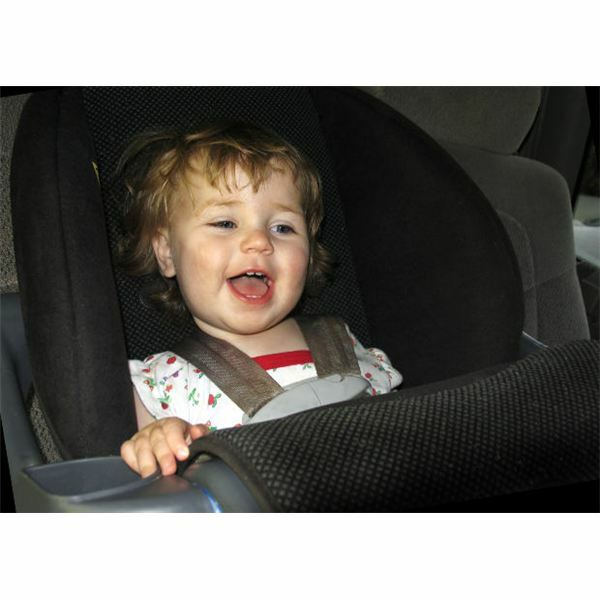 Read all instructions and warnings on the product, product labels, and instruction manuals before using any child restraint system. Missing instructions may be available on the company's website. The manufacturer's address and phone number are listed on the seat's label. Never use a car seat that does not have a label with the date of manufacture and model number or a safety seat with unknown history. Consult your vehicle owner’s manual to determine proper placement of the child restraint in your vehicle and familiarize yourself with your vehicle’s components. Children should remain in a booster seat until adult seat belts fit properly (usually when the child reaches about 4 feet 9 inches in height and is between 8 and 12 years of age). Since children vary in size, safety experts urge parents to use the weight and height restrictions instead of the age guidelines. 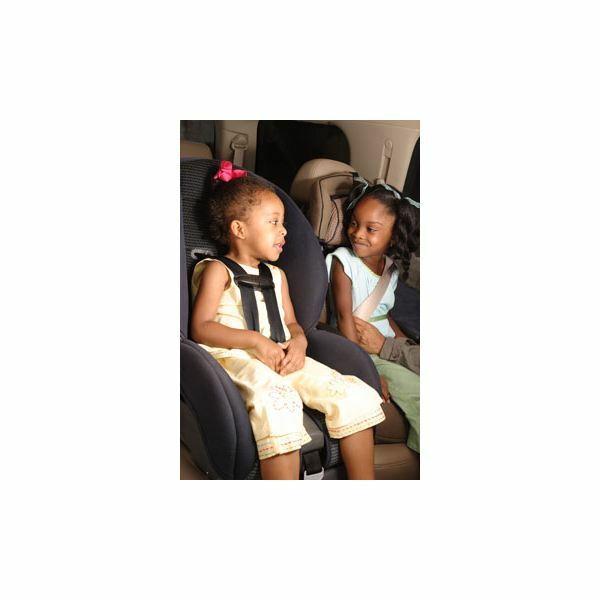 A booster seat lifts a child and properly sets the vehicle's lap or shoulder belts on children who are too small to fit the adult seat belt safely and exceed the weight or height limit for forward-facing seats. Consult a health care professional, physiotherapist or occupational therapist for information on special needs restraints (for low-birth weight infants, children with poor trunk control, casts and children diagnosed with a developmental disability). Safety vests and car beds are alternate options for children unable to use conventional car seats. Booster seats raise children so the seat belts fit properly and reduce the risk of accident injury. Adult seat belts may cause injury because they don't support children securely. Backless boosters appear less "babyish," so are often preferred by older children. Easily transferred from vehicle to vehicle, they are compact and lightweight. Use of a backless booster requires a rear seating area with a high seat back or headrest to prevent whiplash injuries. The top of the rear car seat should be higher than the top of the child's ears. Often, backless boosters come with a shoulder belt adjuster if the shoulder belt does not fit securely and in the right position. It should not cut in near their neck and should lay flush on their shoulder. If there is no rear headrest available, high-back boosters provides better head support in vehicles with a low-seat back. Some studies have concluded that high-back boosters improve protection in side-impact crashes because of better head support. Belt Position Boosters (BPB) are used forward-facing only and used with the adult lap and seat belt. The shoulder belt should cross the chest, resting snugly on the shoulder, and the lap belt should rest low across the upper thighs. The lap belt should never reach the stomach. 2-to-1 Eddie Bauer Highback Booster, Evenflo – Big Kid High Back Booster, Costco Juvenile Eldorado Pronto and Britax Parkway SG are BPB car seats allowing recline positions for napping children. The 2-to-1 Eddie Bauer Highback Booster includes Lower Anchors and Tethers for Children (LATCH). LATCH is a system for installing a car seat which consists of a belt with hooks on the end and an upper tether. Used in place of the vehicle seat belts, LATCH anchors are typically found in the back seat in the crack between the bottom seat cushhion and the back cushion. Read the vehicle's instruction manual to determine where to install your LATCH system. Combination Seats have a forward-facing internal harness plus the ability to convert to a Belt Positioning Booster. These are very popular choices for parents hoping to get more use from their car seat because of weight limits of approximately 30 – 100 lbs. Most combination boosters require the use of the shoulder and lap belt after the child weighs 40 lbs, although some harnesses can be used at 65 to 80 lbs. The Britax Frontier 85 Combination Harness-2-Booster ($225.00) boasts a five-point harnessed weight capacity up to 85 pounds with a 20 inch shoulder harness height. The seat also serves as a vehicle belt-positioning booster up to 120 pounds. Evenflo's Maestro Booster's ($84.99) internal 5-point harness is rated to 20-50 and 40 – 100 lbs with a vehicle seat belt. The Insurance Institute for Highway Safety (I.I.H.S) recommends 21 booster seats which provide good lap and should belt fit for typical four to eight year olds. The list includes booster seats that are over $200, as well as seats as low as $28. Consider the child's temperament and maturity level before graduating into a booster seat. Children must be capable of sitting up without leaning over and keeping the belts buckled. Some children may be able to put too much slack in a seatbelt, and other children do not want to use a child restraint or seatbelt at all. Using a seatbelt yourself sets an excellent example. Refusing to put the car in motion unless the child stays in their restraint is another. Never make an exception and allow them not to use their child restraint. Lap and shoulder seat belts should be used when children are old enough and large enough to use the vehicle seat belt alone. Some safety organizations give limits of 80 or 100 pounds, 4'9" in height or at least 8 years of age. These are rough guidelines, not absolute limits. Children are not ready to be in a regular lap/shoulder seatbelt until they can pass this 5-step test, recommended by the SafetyBeltSafe U.S.A.
All children younger than 13 years should be restrained in the rear seats of vehicles for optimal protection with each passenger having their own lap and shoulder belt. Never allow children to share a seatbelt! One of the most important jobs families have is keeping children safe when riding in a vehicle. Long gone are the days of children rattling around in the back seat of the station wagon, bouncing around casually, uncontrolled and unrestrained. The safest child restraint is one that fits your child's size, is correctly installed and is used properly every time you drive.